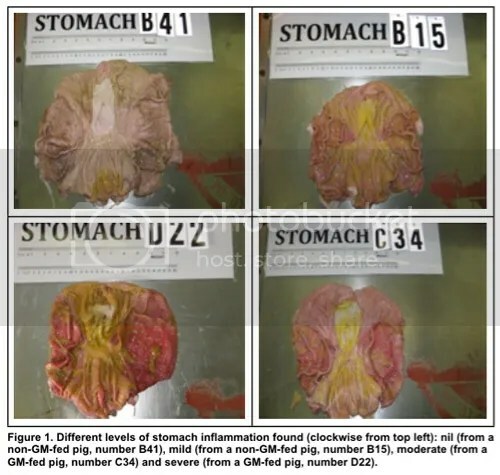 Photos of pigs’ stomachs from the study. “A new study by scientist Judy Carman, PhD. that was just published in the peer reviewed journal Organic Systems on the effects of a (now normal) diet of mixed GMO feeds for pigs causes some disturbing health problems, particularly regarding the digestive and reproductive systems and a likely strong involvement of the endocrine system. Like the now famous Seralini GMO study on rats, this one was also designed as a “lifetime” test but was not designed for the natural life span of 10 years or so that domesticated pigs could have, instead it was based on a lifetime of approximately 6 months which is the norm in today’s pig industry. The industry standard for previous GMO tests is a mere 90 days on rats, and of course this standard was set by Monsanto itself since they have never allowed independent testing of their controversial GMOs (they actually tested them for more than 90 days but stopped testing and hid the results of everything after that point, likely due to evidence that GMOs are and were harmful to their health). One of the general findings of this study were that the pigs fed GMO feed after being weaned from their mothers were approximately 2.6 times more likely to have severe inflammation of the stomach and stomach lining. The precise causes of this dramatic increase in inflammation are not fully known at this time, only that GMOs were proven well beyond the point of statistical significance to be the cause, and the authors of the study are calling for further research into the matter with future more focused studies. The general belief of the possible cause is that the Cry proteins from the Bt toxin producing/containing GMOs are likely much worse for humans than previously believed, as they have been found to be forming bonds and avoiding digestion in previous tests on both mice and pigs throughout not only the stomach but the vast majority of the digestive tract. While neither pigs nor us are insects, it’s worth noting that these proteins are chosen as a potent insecticide because it has similar actions on their digestive systems, only magnified to be strong enough to rupture their stomachs completely in a short period of time. It’s also important to consider when looking at this study that the findings are very conservative and understated as all the test pigs were born to and raised by GMO fed sows before being weaned and entered into the test, and even the non-GMO fed test subjects were fed with feed tainted with approximately 1% GMOs as that is the norm in US without going to extra lengths to find a purer source. Inflammation of this type and degree can cause numerous health complications in the long term, up to and including cancer. Read more on Occupy Monsanto. A summary by the study’s author. Thanks to Raoul Bedi for researching and compiling this information. Some people have compared this study with Michael Schmidt’s famous Tale of Two Calves experiment, which contrasts the effects of feeding raw milk vs pasteurized milk to calves. Although that was less scientific, the differences in photographs of the animal organs between the two test subjects made for a graphic contrast. The report on the two calves study is the runaway most popular post of all time, in the history of The Bovine. The body of evidence against GMO’s continues to mount. When will the authorities fulfill their obligations to protect the public’s health? I’m not holding my breath… One more reason to know your farmer.